The dollar sign ($) following Gender in the INPUT statement indicates that Gender is a character variable. The trailing at signs (@@) enable the procedure to read more than one observation per line. You can use a group t test to determine whether the mean golf score for the men in the class differs significantly from the mean score for the women. If you also suspect that the distributions of the golf scores of males and females have unequal variances, then you might want to specify the COCHRAN option in order to use the Cochran approximation (in addition to the Satterthwaite approximation, which is included by default). The following statements invoke PROC TTEST for the case of unequal variances, along with both types of confidence limits for the pooled standard deviation. The CLASS statement contains the variable that distinguishes the groups being compared, and the VAR statement specifies the response variable to be used in calculations. The COCHRAN option produces p-values for the unequal variance situation by using the Cochran and Cox (1950) approximation. Equal-tailed and uniformly most powerful unbiased (UMPU) confidence intervals for are requested by the CI= option. Output from these statements is displayed in Figure 119.4 through Figure 119.7. Simple statistics for the two populations being compared, as well as for the difference of the means between the populations, are displayed in Figure 119.4. The Gender column indicates the population corresponding to the statistics in that row. The sample size (N), mean, standard deviation, standard error, and minimum and maximum values are displayed. Confidence limits for means and standard deviations are shown in Figure 119.5. For the mean differences, both pooled (assuming equal variances for males and females) and Satterthwaite (assuming unequal variances) 95% intervals are shown. The confidence limits for the standard deviations are of the equal-tailed variety. The test statistics, associated degrees of freedom, and p-values are displayed in Figure 119.6. The Method column denotes which t test is being used for that row, and the Variances column indicates what assumption about variances is being made. The pooled test assumes that the two populations have equal variances and uses degrees of freedom , where and are the sample sizes for the two populations. The remaining two tests do not assume that the populations have equal variances. The Satterthwaite test uses the Satterthwaite approximation for degrees of freedom, while the Cochran test uses the Cochran and Cox approximation for the p-value. All three tests result in highly significant p-values, supporting the conclusion of a significant difference between males’ and females’ golf scores. The "Equality of Variances" test in Figure 119.7 reveals insufficient evidence of unequal variances (the Folded F statistic = 1.53, with p = 0.6189). The summary panel in Figure 119.8 shows comparative histograms, normal and kernel densities, and box plots, comparing the distribution of golf scores between genders. 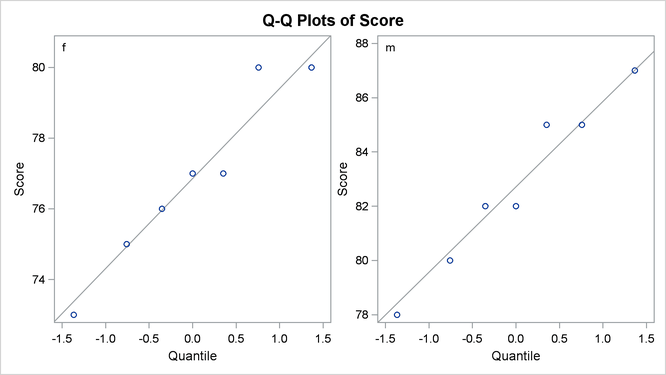 The Q-Q plots in Figure 119.9 assess the normality assumption for each gender. The plots for both males and females show no obvious deviations from normality. 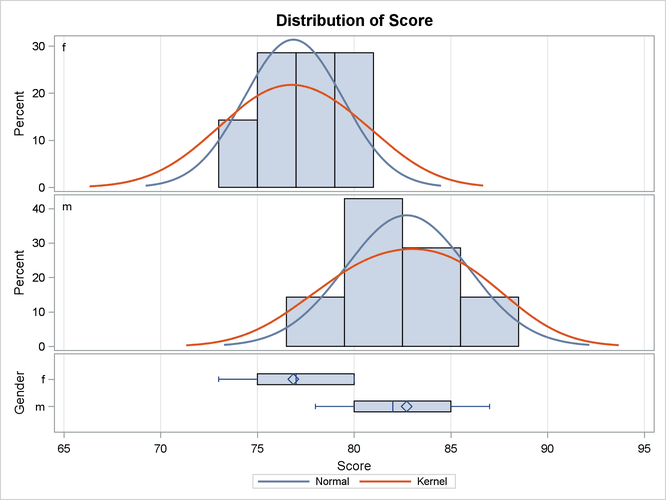 You can check the assumption of normality more rigorously by using PROC UNIVARIATE with the NORMAL option; if the assumption of normality is not reasonable, you should analyze the data with the nonparametric Wilcoxon rank sum test by using PROC NPAR1WAY.